Last week my friend Shalini was telling me about methi chaman gravy (Methi = Fenugreek leaves in English, Vendhaya keerai in Tamil, methi in Hindi, Menthe soppu in Kannada) she had in a restaurant. She told her family loved the gravy a lot and suggested me to give a try. She also shared me a link with a recipe close to the restaurant style methi chaman. Actually speaking, I have no idea about this recipe and its origin. So I browsed few more recipes to know its birth and came to know methi chaman is from Kashmir and it is very popular in Mumbai too. It is a mildly spicy curry/ gravy made using palak, fenugreek leaves/Methi leaves. 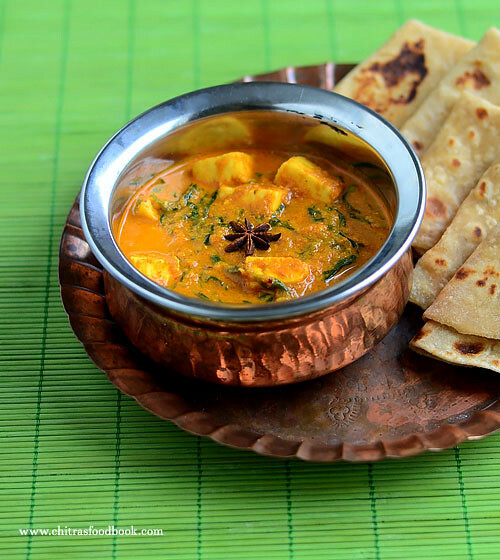 It is popularly known as Hariyali Methi Chaman.Today I have shared Paneer methi chaman recipe. I am not sure this is the authentic recipe because I found many variations in this basic methi chaman recipe by adding paneer, Palak, sweet corn etc. In fact my friend Shalini tasted makai methi chaman in which sweet corn and methi leaves were the major ingredients. It is without paneer and palak. But its my first attempt for this recipe. So I blindly followed the recipe shared in the link. It came out finger licking good.Its a good side dish for roti, naan, kulcha, ghee rice and mild pulao varieties. I loved it like anything and found “Kitchen King Masala” is the star ingredient for this particular recipe. Friends, do buy a pack of kitchen king masala if you don’t have in your hand.It gives restaurant style taste and flavor to North Indian gravies. 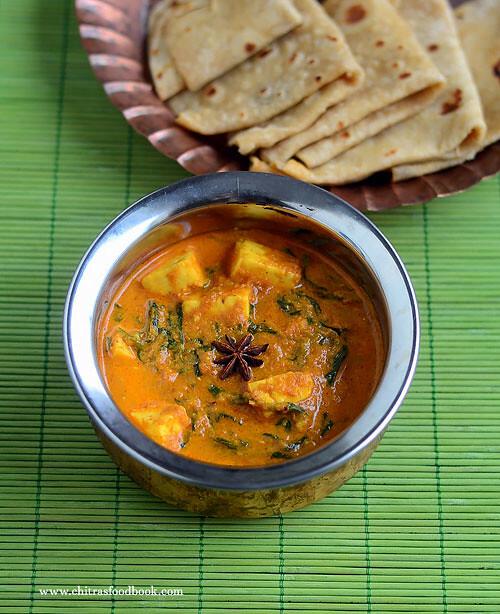 If you don’t have fenugreek leaves, you can use crushed kasuri methi ( Dried frenugreek leaves) too.Ok, lets see how to make methi chaman gravy with paneer. Cut paneer into cubes.Chop tomato, slice onions. Boil 2 cups of water till water starts to roll boil.Add the paneer cubes. Take fenugreek leaves ( methi leaves) & wash it thrice to remove the dust. Heat 1 tbsp oil in a kadai. Crackle cumin seeds. Saute onion till transparent. Add ginger pieces,cashews. Then saute tomato till mushy adding some salt. Let the mixture cool down. Grind to a smooth paste adding required water. Heat 1 cup of water & add 1/2 tsp sugar and the washed leaves. Boil for few minutes till the leaves cook well. Cook till all the water drains out. For variation, you can saute the leaves in oil instead of blanching to reduce the bitterness.Also you can grind the cooked leaves to a paste and add to the gravy. This gives green colored base to the gravy. Heat 1 tbsp oil in the kadai. Saute the tomato-onion paste, 1/4 cup of water, turmeric powder, red chilli powder, dhania powder, kitchen king masala powder, required salt. Mix well till oil starts to ooze out. To this add the blanched methi leaves and some water, mix well and let it boil.Check for taste and add more salt, spice powders if needed. Add the paneer cubes, boiled milk and let the gravy boil for a minute. Check the consistency and switch off the flame. Add fresh cream if you like. Mix well and serve hot with roti/Pulao/Naan. 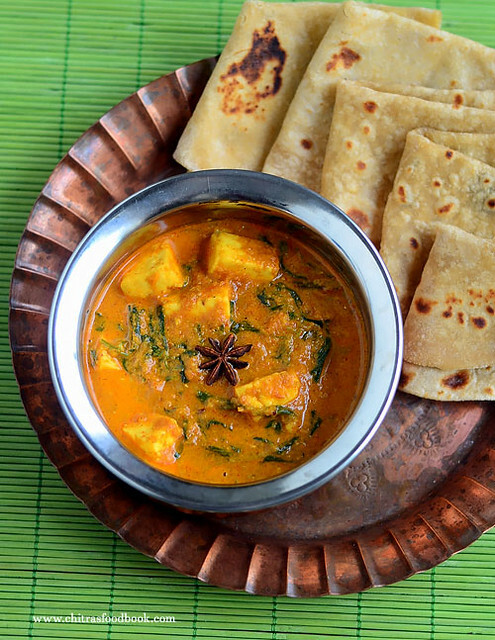 Enjoy restaurant style Paneer methi chaman recipe with roti/naan !! Plz tell which brand of kitchen king masala is good. Also share how to make this at home. Do u have recipe of instant idly mix powder just like MTR? I used Kwality brand kitchen king masala. I will try to make a post on homemade kitchen king masala. I have flax seeds idli powder, Garlic idli powder recipes.Please search it in my blog.